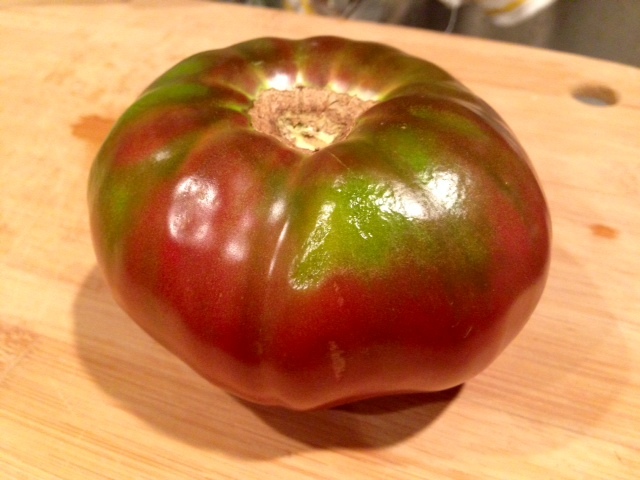 Heirloom tomatoes in season are seriously one of my favorite foods. In fact, I got to have a fancy dinner last night and there was an heirloom tomato and burrata salad that I could have eaten gallons of. I was in paradise. So last week at the farmer’s market when I saw these gorgeous big lumpy heirloom tomatoes, I had to get my paws on them immediately. Thoughts of juicy chunks of tomato swimming in creamy, salty ricotta and tossed with al dente pasta danced through my head. I had plans. Then plans changed, and I had friends coming over that night, last-minute. Since they’re gluten-, dairy-, and egg-free, I had to make some adjustments to my master plan. 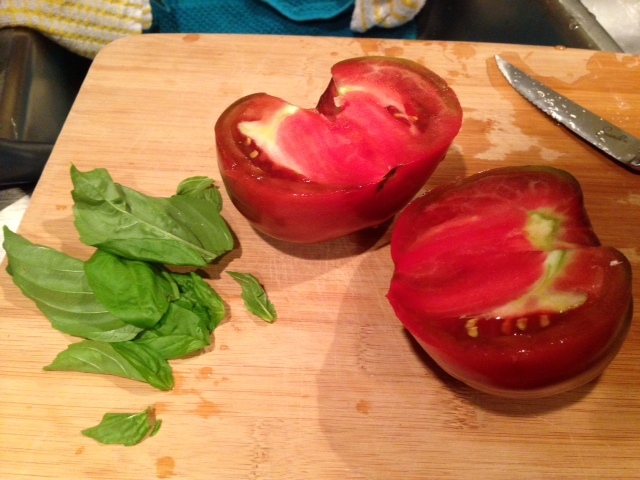 I racked my brain to find something that they’d be able to eat and would still do these beautiful tomatoes justice. 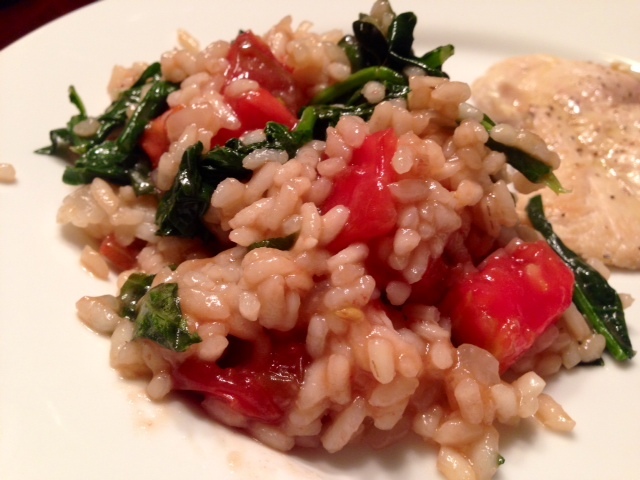 I landed upon a simple risotto, with a few adjustments to accommodate their health challenges (namely, I left out the butter and parmesan—sad, but necessary). I was worried it wouldn’t be nearly creamy enough, but it was still totally delicious. 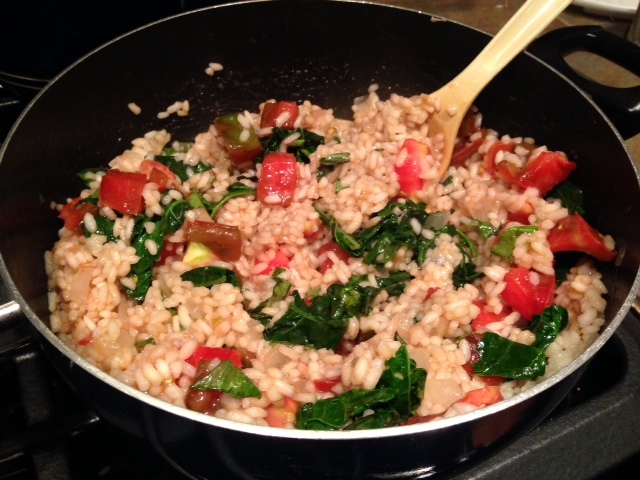 My love of risotto is legendary, and I’ve never understood why people are so scared to make it. Yes, it’s time consuming and takes a little TLC, but it’s also very straightforward, not difficult at all. It’s the perfect dish to put on the stove when you already have people over and want to just stand there and drink wine and chat and stir constantly. Or heck, make your guests stir and drink wine and chat while you put the rest of the meal together. 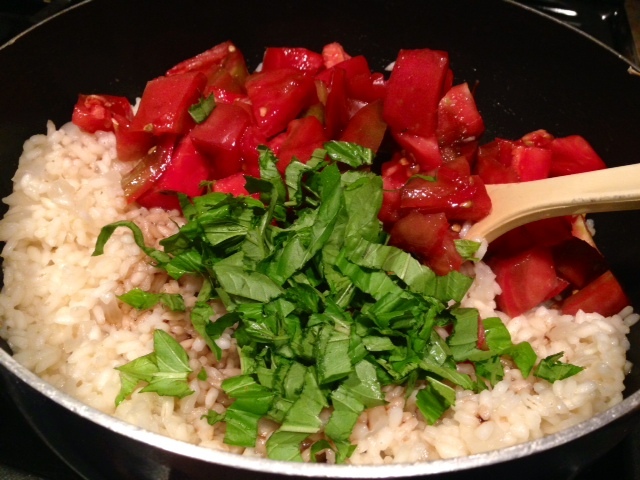 This version lets the tomatoes be the star, with a supporting cast of fresh basil and balsamic vinegar to add just a little extra. Heat the stock in a pot on the stove, keeping it steaming hot but not boiling at all. Dice up the onions and garlic. In a large heavy-bottomed pot or Dutch oven, heat the butter and olive oil on medium-high. 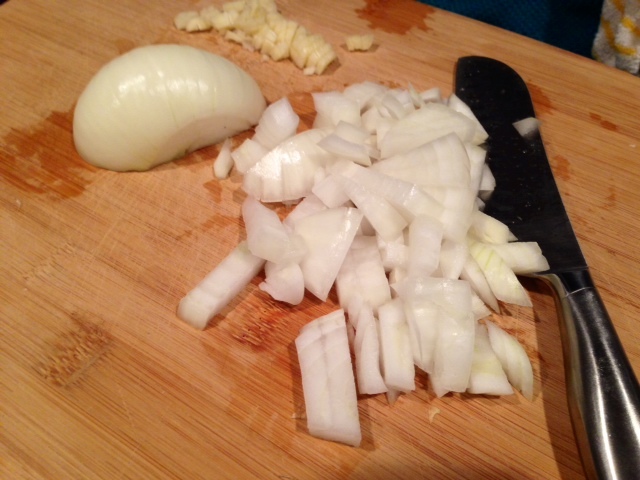 Add the diced onions and sauté until translucent, it will take about 6 to 8 minutes. 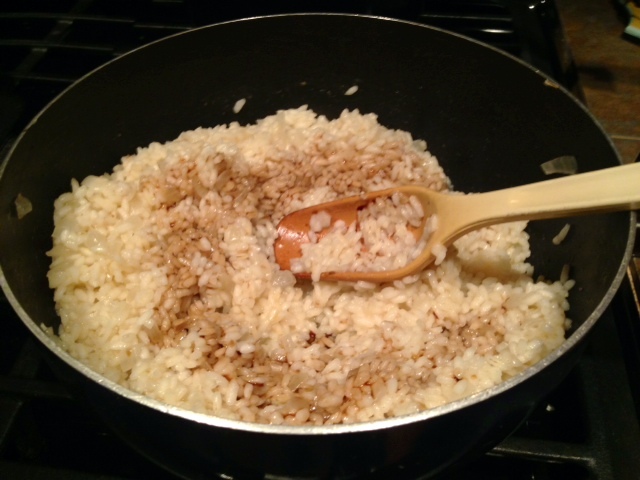 Stir in the rice and garlic, stirring constantly and cooking until the kernels start to turn golden brown. This will take about 5 minutes. Now things get awesome. Pour in the wine and stir, allowing the liquid to almost evaporate. And now it smells AMAZING in your kitchen! Turn down the heat to medium. Add a big ladleful of hot stock, stirring until almost completely absorbed. Continue adding the stock a ladleful at a time, stirring frequently. Don’t add the next ladleful until the previous liquid is basically gone. 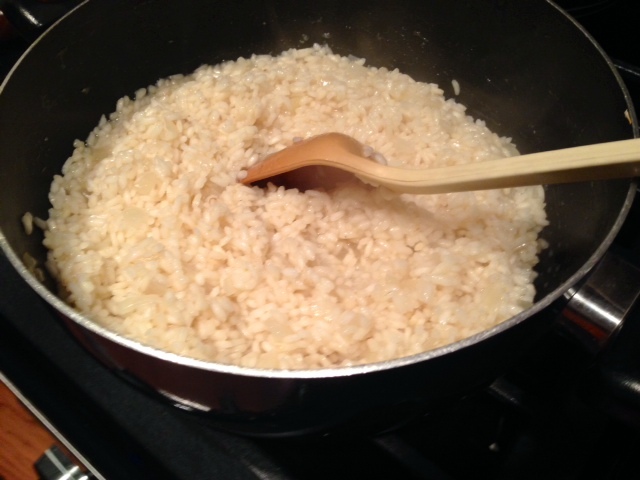 Just keep adding and stirring until the rice is al dente and all the liquid has been absorbed. Depending on your stove and some other variables, this whole process will take anywhere from 20 minutes to 45. 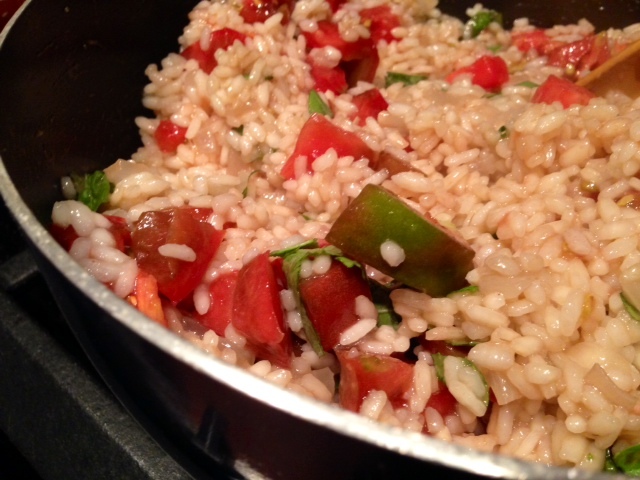 It’s important not to rush it though, I’ve rushed risotto before and always regretted it. Once all the liquid has been absorbed, season with salt and pepper (remember you’ll still be adding the parmesan, so go easy on the salt). 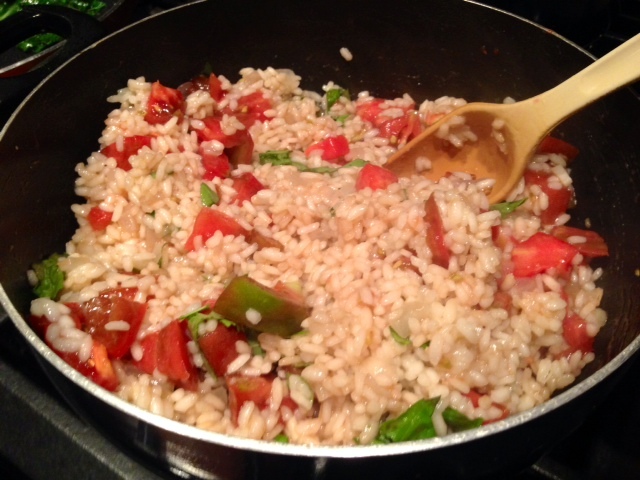 I’m partial to white pepper in risotto myself, has a more mild, nutty pepper flavor. Add the balsamic vinegar and stir together. Stir in the tomatoes, most of the basil, the other 2 tablespoons of butter, and half of the parmesan right as you’re ready to serve. Serve with the remaining parmesan and basil on top. We threw in some kale for good measure, because why not?? In a large heavy bottom pot or Dutch oven, heat butter and olive oil on medium-high. 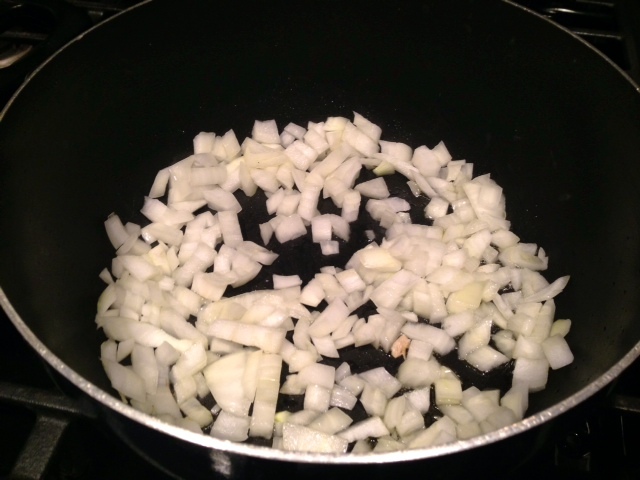 Add the diced onions and sauté until translucent, about 6 to 8 minutes. 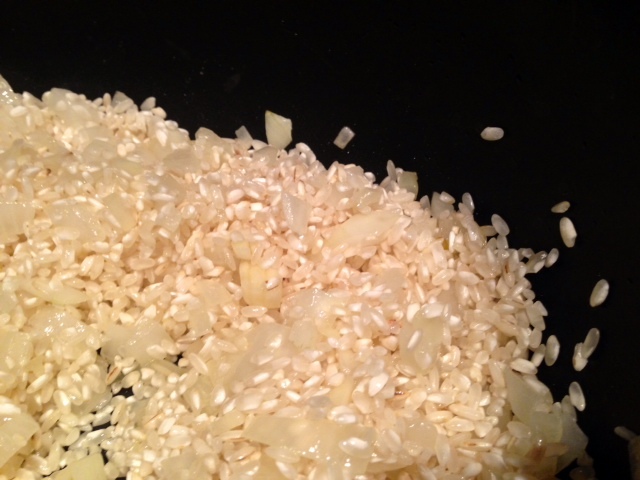 Stir in the rice and garlic, cooking until kernels start to turn golden brown (about 5 minutes). Pour in the wine and deglaze, allowing the liquid to almost evaporate. Turn down the heat to medium. Add a big ladleful of hot stock, stirring until almost completely absorbed. Continue adding the stock a ladleful at a time, stirring frequently. Don’t add the next ladleful until the previous liquid is basically gone. 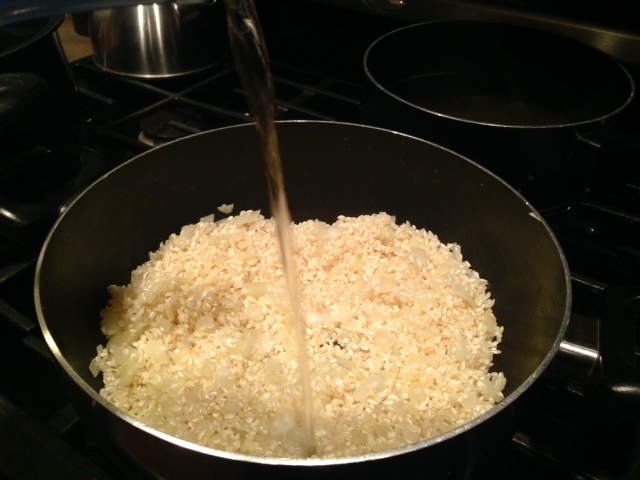 Keep adding and stirring until the rice is al dente and all the liquid has been absorbed. The whole process should take about 20-45 minutes, depending on your stove and other factors. Don’t rush it though. 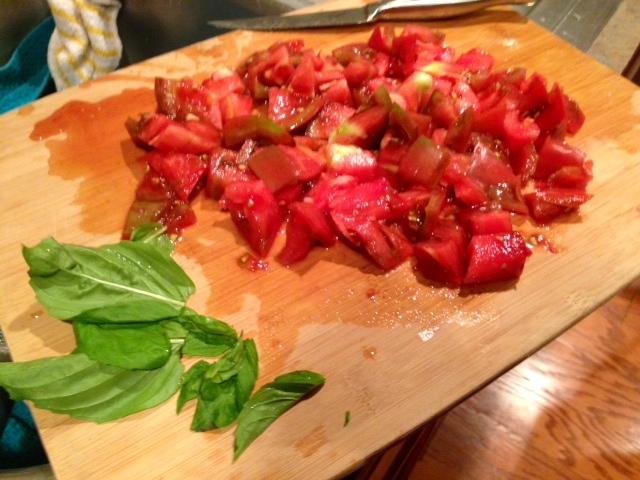 Season with salt and pepper, and add the balsamic vinegar. At the last minute stir in the tomatoes, most of the basil, the other 2 tablespoons of butter, and half of the parmesan. Serve with the remaining parmesan and basil on top.